Amazon’s voice-activated Echo speakers already tell you things. Now, they can show you stuff, too. On Tuesday, the company unveiled the Echo Show, which features a seven-inch touch screen that can pull up calendar appointments, display music lyrics, play videos and a lot more. The Echo Show will cost US$229 when it goes on sale in late June, $50 more than the current high-end model. The debut follows last month’s introduction of the Echo Look, which can evaluate a user’s wardrobe. Including the two new entrants, Amazon will have five products in the Echo line-up, all powered by the Alexa digital assistant. Amazon’s gadget business isn’t about big profits; it’s a way to hook consumers into the company’s fast-growing retail business and get people to sign up for the lucrative Prime subscription service. Meanwhile, Amazon has managed to outflank Google, which began selling its Home device two years after the Echo debuted, and Apple, which is still working on its own Siri-based version. Amazon won’t say how many Echos have been sold, but it has grabbed 70% of the US market for voice-assisted speakers, according to eMarketer, with Google accounting for most of the rest. In a demonstration at Amazon’s San Francisco offices, the Echo Show displayed full weather forecasts, news headlines and LeBron James highlights. The company says the device will also play camera feeds from such connected devices as baby monitors and camera-equipped door bells. Services that already connect to the Echo will be able to display information — say, how far an Uber is from your front door. Alexa currently supports 12 000 “skills”, Amazon’s term for third-party services, and over time will offer increasingly comprehensive information, such as the points scored by a specific player. “We’re not trying to build a phone or tablet interface on this, but extend that ambient nature of what you already have with an Echo,” says Amazon devices chief Dave Limp, who has been testing the Show at home for about a year. This is the first Echo speaker with a built-in camera. The 5-megapixel sensor makes possible a new video conferencing service that Amazon is rolling out alongside the new hardware. 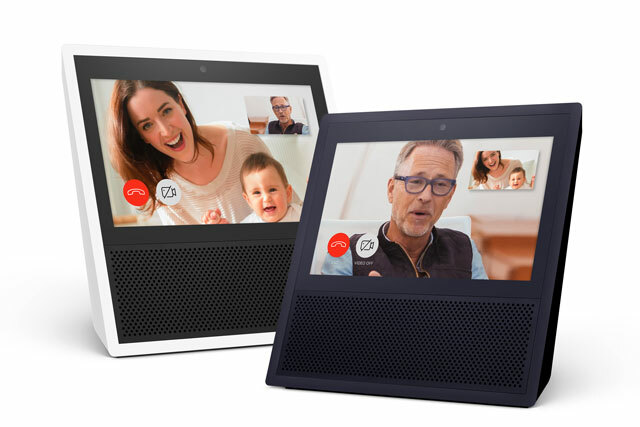 Similar to Apple’s FaceTime, the service lets people make video calls from one Echo Show to another, or between the Show and an updated Alexa app on a smartphone. The service doubles as an intercom, allowing a person to call an Alexa speaker in another room without a camera. 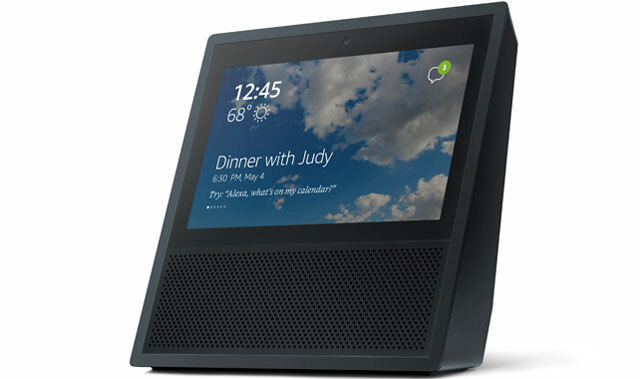 Users can’t currently make cellphone calls via the Echo Show. The Echo Show screen is slightly smaller than an iPad mini’s and the same size as the Kindle Fire tablet. The Intel-powered device has better sound than its predecessor, eight microphones instead of seven and can now connect directly to WiFi, not solely via the Alexa smartphone app. By pushing a button, you can disable the camera and microphones. Limp says hackers won’t be able to activate the camera remotely. Will the new Echo enhance Amazon’s first-mover advantage? Photos of the Show — a black or white wedge of plastic — elicited decidedly mixed reviews on Twitter, with one person saying it belonged on Star Trek (presumably the original) and another comparing it with the Chumby, a chunky digital assistant whose maker filed for bankruptcy. The Show may also be too pricey for many consumers. A report released on Monday by Consumer Intelligence Research Partners in Chicago said the cheapest Echo product, the $50, hockey puck-shaped Dot, has accounted for more than half of the estimated 10,7m Echo devices sold since 2014. Plus Apple, maker of beautiful products even when they aren’t hits, potentially could leapfrog the Show. In a recent research note, analyst Ming-Chi Kuo said Apple may debut an Echo rival next month at the company’s annual developer’s conference.